Join us in celebrating Mexican culture at our “Día de los Muertos” festival with live music, art activities, food, and an innovative altar display featuring a 3-D Tree of Life with projected images of artwork by local artists. 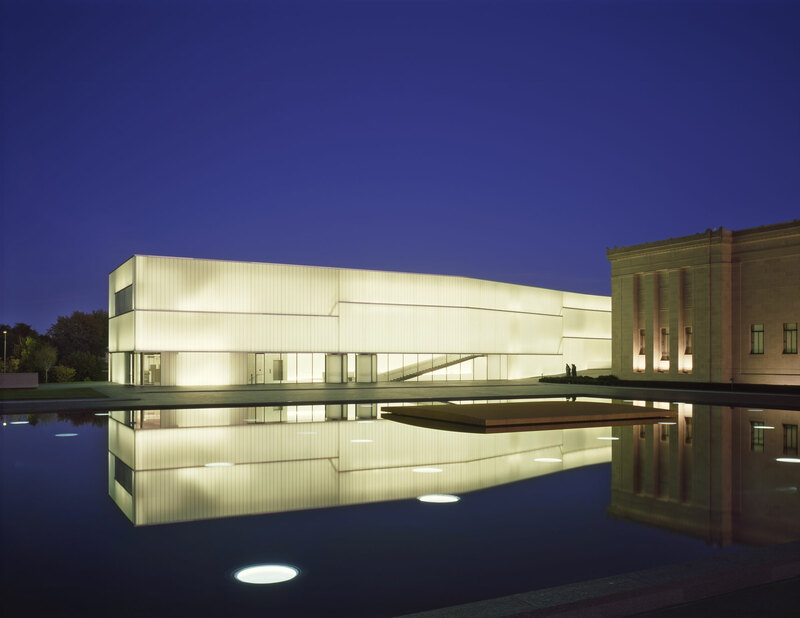 Additional parking and FREE shuttle to the museum available at Kauffman Foundation & Kauffman Gardens, 4800-01 Rockhill Road, 9 a.m.–5 p.m.
FREE parking in garage for museum members. $10 parking for nonmembers. This year’s display offers an innovative presentation of the Tree of Life, a well-known Day of the Dead tradition. A 3-D tree sculpture is the focal point, with projected images of artwork created by local artists from Mattie Rhodes Center and children from area schools. You are invited to add your own special remembrance. Artist, writer, and radio host Maria Vasquez Boyd, local writers Miguel Morales and Whitney Boyd, and Angelica Silva of the Migrant Farm Workers Project read selected poetry. *Special welcome at 12:30 p.m. Since its founding in 2005, M5 Mexican Brass have established themselves as Latin America’s most successful Brass Quintet with wide international recognition. Performance supported by the Consulate of Mexico in Kansas City and the Mexican Agency of International Cooperation for Development. Apply a custom temporary tattoo. Pick up a print by local artists Erick Felix and Nic Ortega fresh off their mobile printing press. While supplies last. Demonstrations by local artists from Mattie Rhodes Center. Enjoy a special book display and color a Day of the Dead themed bookmark. Experience the vocal harmonies of the “bolero” style of Latin romantic music and dance the rumba and cumbia. Maria the Mexican is an American Soul/Mexicana Groove band of four multitalented musicians. Decorate a paper Tree of Life with traditional motifs. Repeats 11:30-11:50 a.m. & 1:30-1:50 p.m. Gather around the Tree of Life to hear a Mexican folk tale about Medio Pollito, a little chicken born with just one leg, one wing, one eye, and half a beak! The Dancing Calacas wear elaborately designed dresses and perform dances choreographed to illustrate life cycles of plants, animals, and people. Pose for pictures with the Dancing Calacas throughout the day. 11 a.m.–3 p.m. Lunch | Desserts and beverages until 4 p.m.
11 a.m.-4 p.m. | Try Mexican-inspired fare in Bloch Lobby. Prices vary. 11 a.m.–4 p.m. | The Tamale Kitchen. Purchase handmade tamales and support opportunities for the Hispanic community in the Northeast Kansas City area. Tamales $3.50, sodas $1.50. Support for the day’s activities is provided by W.K. Kellogg Foundation Trustee Donor Advised Fund.